St Caimins of Shannon suffered a major setback in their Dr Harty Cup campaign after losing by three points to St Francis College, Rochestown. It was a game that could have went either way but the ability of the Cork side to take their chances proved crucial as their opponents could not match them in that sector. Wolfe Tones clubman, Ben O Gorman opened the scoring with less than a minute played. Three points in succession from the impressive, Shane Kingston put Rochestwown in the lead with seven minutes on the clock. County minor, Aron Shanagher pointed from a dead ball with eight minutes gone to lower the gap. Ben O Gorman took over the freetaking shortly after and rightly so as he raised a white flag at the halfway stage to level matters. Points from Shanagher and O Gorman put Caimins back in the lead with eighteen minutes played. Rochestown replied with both Ciaran Cormack and John O Sullivan getting on the scoresheet. Again it was left to O Gorman and Shangher to score for the Shannon based school and that they did as they added one point each to give St Caimins a two point lead at the break. The first score after the resumption came when the second half was a mere three minutes old and was freetaker Ciaran Cormack who took the honours, Ben O Gorman responded with a point from distance to ensure his side kept the lead. Rochestown took the game by the scruff of the neck at this stage and got four unaswered points with Shane Kingston getting two and one each for Paddy Lynch and Sean Powter. O Gorman replied for St Caimins with thirteen minutes played to leave four between the sides. Freetakers Cormack and O Gorman exchanged scores at both the halfway stage and on the twenty first minute. Shane Kingston, son of Kieran Kingston the former Cork Senior Hurling trainer added to his tally with twenty two minutes on the clock. Part-time butcher, Ben O Gorman showed that he is not just a master craftsman around the town centre of Shannon but also on the hurling field as two further points from his hurley levelled matters with twenty five minutes on the clock. 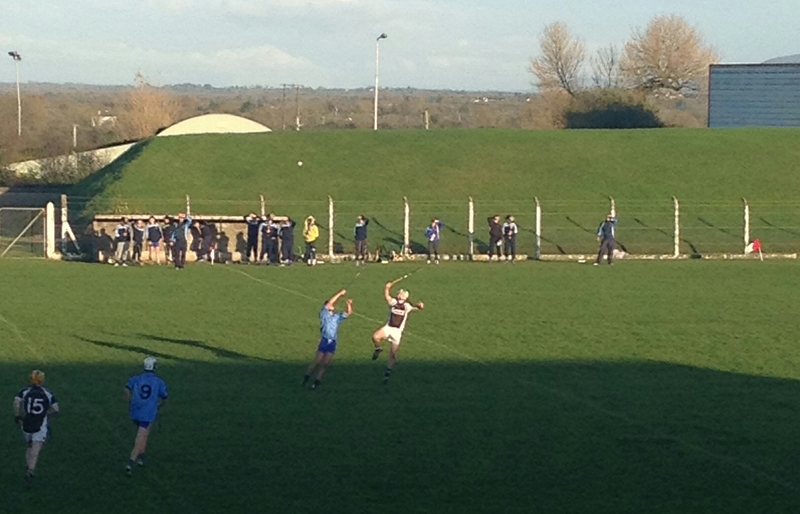 Rochestown sealed the win with three points in succession from the stick of Ciaran Cormack. They could have put the icing on the cake only for a great save from Jack O Connor denied the green flag from being raised. After collecting two points, Rochestown are on top of Group 3 alongside Youghal, but they still have an extra game to play which if they win will give them the top spot. The side managed by Diarmaid Fahy and Michael Cullen were more clinical from open play than their opponents. St Caimins dominated the first half, but to their credit Rochestown stayed patience and waited for their chance to take charge and when they did there was no stopping them. The Cork outfit were stronger when it came to the aerial duels and when it came to the fifty fifty battles, they came out on top for the majority of them. On the day they had exceptional performances from Shane Kingston, David Griffin, John O Sullivan and Ciaran Cormack. St Caimins will look back on this game with regret, for the first half they were completely dominating but once they let Rochestown into the tie early on in the second half they paid the ultimate price. They struggled to win possession around the middle of the field as it was their Rochestown counterparts that swept up the play at stages. Qualifying for the knockout stages is now a bleak possibility for the Shannon school despite being in control for the majority of the game today. Indiscipline was a problem in past performances for this side but the management of Paul Kinnerk and Padraic Duddy seemed to have addressed that flaw with enough conviction. On too many occasions the sliotar left the Caimins inside line too easily and had they been stronger in this sector, they would have claimed victory on the day. However, they never gave up and showed great pride and honesty in the jersey which has always been a feature of St Caimins teams down through the years. For St Caimins, Rory Hayes, Kieran O Connor and Ben O Gorman stood out. Teams: St Francis College Rochestown: Andrew Cullinane (Douglas), Donnchadh Murphy (Douglas), David Griffin (Carrigaline), Cathal Sheehan (Douglas), Darragh Kelliher (Cobh), John Cashman (Blackrock), Ryan Cantwell (Blackrock), Eoghan O Brien (Douglas), John O Sullivan (0-01) (Blackrock), Diarmaid O Mahony (Douglas), Ciaran Cormack (0-07 5f) (Blackrock), Shane Kingston (0-06) (Douglas), Paddy Lynch (0-01) (Blackrock), Sean Powter (0-01) (Douglas), Liam O Sullivan (Blackrock). Subs: Liam Dineen (Douglas) for Lynch (55:34), Matthew Mc Aulliffe (Douglas) for Cashman. St Caimins Community College: Jack O Connor (Newmarket on Fergus), Kieran O Connor (Cratloe), Cathal Lynch (Sixmilebridge), Liam O Connor (Newmarket on Fergus), Greg Collins (Newmarket on Fergus), Patrick Mulready (Sixmilebridge), Colin Guilfoyle (Newmarket on Fergus), Jack Cunningham (Wolfe Tones), Dean Devanney (Wolfe Tones), Rory Hayes (Wolfe Tones), Ben O Gorman (0-10 6f) (Wolfe Tones), Daragh Mc Mahon (Wolfe Tones), Eoin Flynn (Sixmilebridge), Aron Shanagher (0-03 2f)(Wolfe Tones), Cathaoir Agnew (Sixmilebridge).